Fall in the midwest and on the prairie is mostly about what we used to call SYCs, stinking yellow composites, an equivalent of birder's LBJs, little brown job. And yes, it takes a bit of work and experience to get beyond the it's a composite (aster/sunflower family) and yellow stage. 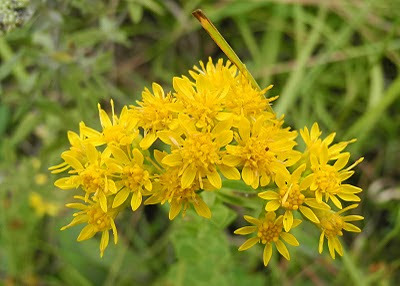 Today's fabulous flower, flowers actually, is a favorite fall SYC that deserves to be in any perennial garden, the stiff goldenrod (Solidago rigida). The leaves of this plant are quite stiff with a rough surface, one of the many stiff, rough, prickly sort of things so abundant on the prairie in the fall. But what makes this goldenrod's floral display so fabulous are the ray flowers, which are only found in a handful of the 50 or so species in northeastern N. America. For those uninitiated to composites, each "petal" is actually a flower whose short tubular corolla has a single strap-like lobe. The corolla of the central disk flowers has five small lobes. In some of these little heads the disk flowers have yet to open. Lots of goldenrods flower this time of year, and because they are conspicuous, they often get blamed for causing people's fall-season hayfever, but because they are conspicuous they don't. Such conspicuous flowers are insect-pollinated, so the pollen doesn't end up inside your nasal passages, but the wind-pollinated ragweeds, also composites, with their very inconspicuous flowers are flowering at the same time. And then there are the LBM's (Little Brown Mushrooms) which are so difficult to distinguish that one eats them at ones peril.